For decades, paleontologists have wondered about a mysterious, toothy jaw fragment discovered on the island of Madagascar. Dating to the mid-Jurassic period about 166 million years ago, the jaw was clearly from a large predatory animal—but what kind, exactly? Now scientists have finally identified the species, Razanandrongobe sakalavae (nicknamed Razana), as an enormous crocodile ancestor. It was likely an apex land predator whose teeth were optimized for chomping on bones and tendons. The discovery, described in a recent article in PeerJ, reads a bit like an after-school special about why fossils shouldn't be kept in "private collections." Researchers Cristiano Dal Sasso and Simone Maganuco from the Museo di Storia Naturale in Milan, Italy, were able to recreate and identify this crocodilian's skull only after locating more fossils from the same species in a private individual's cache. This collector had excavated his fossils back in the early 1970s, from exactly the same area in Madagascar that the other Razana skull fragments were found. Because they were not accessible to scientists or the public, these fossils languished in obscurity while Razana's true nature remained a mystery. It was only after the researchers brought this collector's treasure trove to the Muséum d’Histoire Naturelle in Toulouse, France, that they could analyze several large skull fragments from the same animal, identify it, and reconstruct what it looked like in life. Based on the animal's teeth, which the researchers describe as being like those of a T-rex, it would appear that Razana was a fierce hunter who ate pretty much everything that moved on the island. 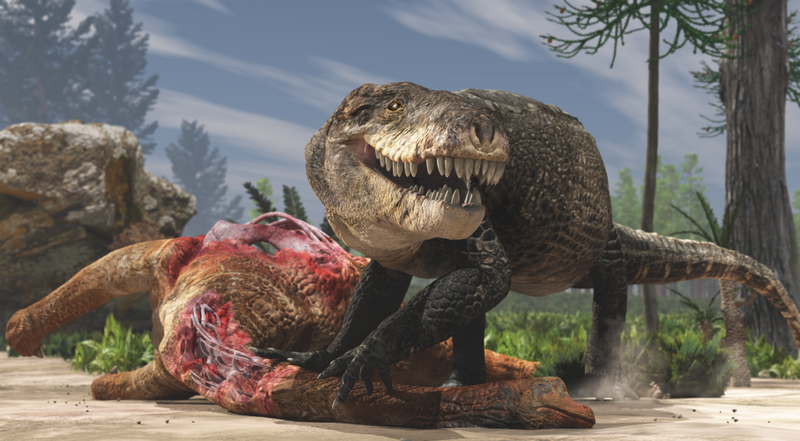 "Like ... other gigantic crocs from the Cretaceous, 'Razana' could outcompete even theropod dinosaurs, at the top of the food chain," Dal Sasso said in a release. The animal would have been about the size of a sport wagon and moved swiftly to grab prey in its formidable jaws. Here you can see the process of recreating the skull, using computed tomography (CT) scans. This allowed researchers to 3-D print missing bones. Technician Andrea Passoni mounts the bone pieces. Note: this video has no sound. Credit: Cristiano Dal Sasso. To reconstruct the shape of Razana's skull, the researchers did a CT scan of the fossils they acquired. They found that the longest of its teeth was 15 cm long, which is pretty impressive. In addition, they reconstructed the shape of its snout and cranium and printed out some missing bone fragments from the front of the skull using 3-D printers at FabLab in Milan. The 3-D prints were basically mirror images of the existing fragments, allowing them to fill out most of the jaw and snout shape. This was enough to identify the animal as part of a clade that includes modern-day crocodiles. The saga of Razana's reconstruction is a reminder that hoarding fossils in your private collection could be preventing the advancement of science. Without data sharing, we might never have discovered the most terrifying crocodile of all time, lurking 166 million years in our planet's past.